What kind of impact does the Creative Spark Vancouver grant have on emerging artists? We asked one of the recipients, Kristin Voth, to share her thoughts with us. Apply by September 15 for $2,000 grants for emerging artists working with young people. Can you tell us a bit about about your project? Weeds and Wilderness developed as a collaboration between myself and Krista Voth, the program coordinator of Pacific Spirit Park Society, who also happens to be my cousin. 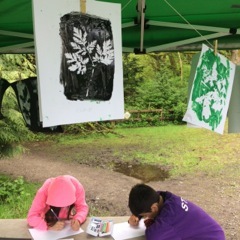 We planned three workshops in three distinct ecosystems within Pacific Spirit Park: forest, stream and bog. Each workshop included a nature walk learning about the relationships between different plants and animals in the region. 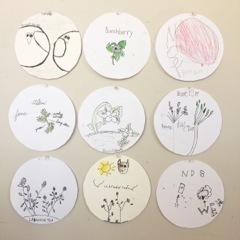 Following these activities, we made art with each group that was inspired by visual artists whose work draws inspiration from nature. All art was created on location in the park. Who participated in this project? Why did you choose to work with this age group and/or community? We were joined by elementary aged children from two after school clubs in East Vancouver. We chose to invite children from neighbourhoods like the Downtown East Side because Pacific Spirit Park is less accessible for many of them. We wanted to offer them a chance to explore the forest in a creative way. Have you ever worked with young people before? How did you find this experience? I have always been drawn to working with children and youth and have worked with kids in daycares and summer camps. The biggest lesson that I learned through this project was that process is central. I tend to be overly preoccupied with the end result, but when working with kids, art-making needs to be about play. Getting messy and having fun in the process is a big part of learning, and it is something to be embraced! The finished project is just a bonus. How did workshop participants respond to your project? I was repeatedly surprised by which activities best engaged the group. Observational drawing, in particular, was a much bigger hit with the children than I expected. 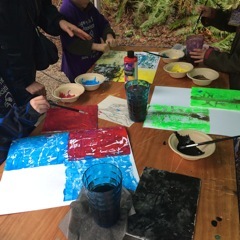 One occasion that comes to mind was when we took a particularly energetic group of 5-7 year olds into a forest clearing to draw the trees, inspired by Emily Carr’s tree paintings. 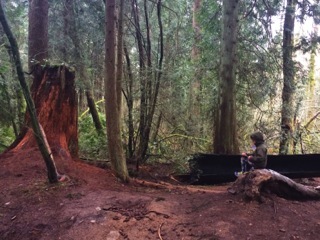 Each participant found a log or stump to sit and capture as many details as they could. The drawings they produced were beautiful, rich with the details they saw around them. Their concentration was tangible and we had to pull them away to start the next activity! How has this project and/or the Creative Spark Vancouver grant impacted you personally as an emerging artist? What I loved about the Creative Spark Vancouver experience was that it enabled me to take an idea, create a plan, and run with it. Because I wasn’t tied to working within the constraints of an already established program, I was able to try something new and run with the idea of making art in the forest. Through that process I was able to develop skills in lesson planning, in collaboration and coordination. As an artist, this strengthened my capacity to take an idea and put it into action. What's next for you as an artist? I’m continuing to work on my personal art practice, which primarily involves exploring themes of reconciliation and promise through figurative acrylic paintings. Currently I’m painting grandparents on lawn chairs. I’ll be exhibiting work at Vancouver Writer’s Fest in October together with The Open Book Art Collective, a group of emerging artists who love to engage with literature through our art. I also hope to continue learning about art education and want to seek opportunities to make art with kids! Creative Spark Vancouver grants support emerging artists interested in building their careers and engaging young people in arts-based projects. The artist's project must engage young people (ages 5-24) and focus on arts-based learning in any artistic discipline. Creative Spark Vancouver enables emerging artists to gain experience on small projects that could lead to new career opportunities, new community relationships, different perspectives on arts and education, future learning opportunities and exciting multi-faceted projects. The program offers full coverage for projects, up to $2,000. Grant funds are intended to cover artist fees, project materials and supplies, rentals and honoraria. Eligible applicants are emerging artists of any age and artistic discipline who are residents of the Vancouver or residents and members of the Musqueam, Squamish or Tsleil-Waututh First Nations. The deadline to apply is Friday, September 15, 2017.